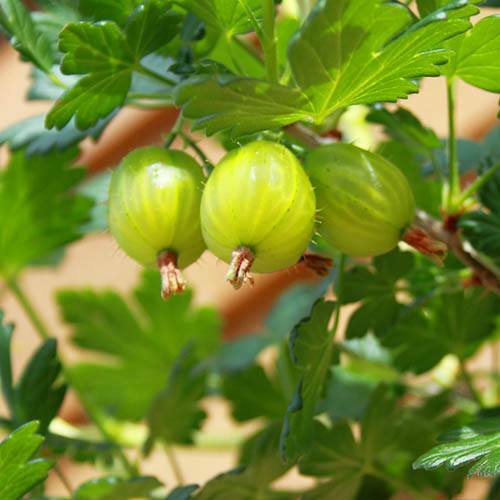 The Number 1 gooseberry for growing in gardens - and commerically as well for that matter. Large yields of big fruit means 'Invicta' really packs a punch - eat fresh from the bush or bake into a pie! Gooseberry 'Invicta' is the Number 1 Outstanding Gooseberry variety for Home Gardeners, and commercial growers too for that matter! Producing big crops of classic green berries, almost twice as many as any other variety, it is also mildew resistant, making it very easy to grow, and has good vigour, so supports the big crops well in your garden. The numerous large green fruits are also sweet enough to eat straight off the bush, or cook with if preferred. 'Invicta' really is the all-round Gooseberry for gardens - why not try one this year? Supplied as a grower quality, Uk produced bush, freshhly potted into 3L pot, ready to plant straight out at 20-25cm tall, multi-branched.